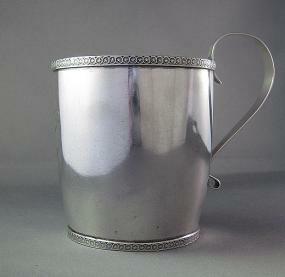 This rare and interesting cup made by Thomas Chester Coit, Natchez, Mississippi, circa 1830. It is the subject of an article written by well-known scholar, Dr. Charles Curb, in the January/February 2009 issue of Silver magazine. Additional documentation as to the original owners and dates Coit’s resided in Natchez was published in the March/April 2009 issue, also by Dr. Curb. Marked T.C. Coit. It is inscribed in a period monogram: “B.P. to L.P.C”.